We provide a range of high quality SS Gear Pumps, which are widely used for hydraulic fluid power applications in various industries. Our range of gear pumps are suitable for handling viscous or semi viscous liquids. These gear pumps are fabricated using premium quality material which is procured from the reliable vendors of the market. Perfectly designed, these compact gear pumps are high in performance and deliver output with maximum accuracy. The SEG series of MALHAR pump has modified profile of teeth to give accurate discharge within the pressure range . The helical gear design delivers constant volume without and pulsation. It also reduces internal slippage and gives high volumetric efficiency. All these are self lubricated pumps recommended for use where the liquid to be transferred has lubrication properties Hence the bearing are lubricated by the pumping fluid and do not need any external lubrication. Easy maintenance due to availability and interchangeability of spares. All MALHAR gear pumps are designed and assembled and with close tolerances to reduce the mechanical losses, thus it consumes less power and operates at higher efficiency. 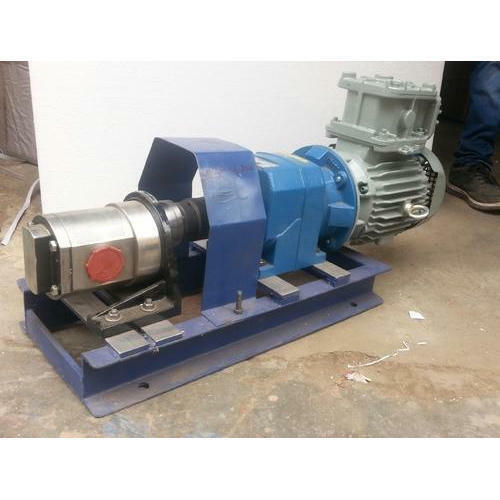 “MALHAR” Rotary gear pumps are useful for handling following viscous and semi viscous liquid. Clean lube oil, Castor oil, Coconut oil, Ground nut oil, Cotton seed oil and Hydraulic oil. Paints & Varnish , Viscous Chemical , Printing Ink. All Kind of fish and animal oils. Rotary gear pumps are widely used in paper mills, refineries, Steel mills and textile Industries. Year of Establishment 2002, Creative Engineers is an offshoot of more than two decade old renowned group “Fair Deal”. Under the able proprietorship of Mr. Gaurang Shah who is a B.E. (Mechanical), the company has grown by leaps and bounds. Entire phase of product development from designing, prototyping to manufacturing are conducted in our vertically integrated manufacturing unit. The sound infrastructural facility and team of experts extends our ability to deliver quality products which include water pumping equipment, liquid pumping equipment, industrial pumping equipment, centrifugal pumps, submersible pumps, self priming pumps, etc. Before the final dispatch of pump goods to the customers, the products are minutely tested by our quality controllers. By virtue of timely delivery of quality products, we have earned a wide clientele base to our credit.